What is limewater or nam pboon sai (น้ำปูนใส)? Limewater is the secret ingredient in Thai cooking that firms up soft fruit for long cooking and makes crispy batter. Let's start with the raw ingredients in making limewater (Nam Pboon Sai). Slaked lime (lime + water = Ca(OH)2 ) or calcium hydroxide is traditionally made with burning shells at high heat and adding the burned shells to water. The water that you get is limewater. However, in Thailand the red lime paste is more common because the paste is used in making paan. 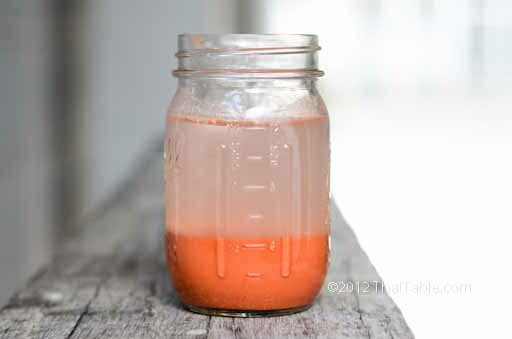 To make limewater from lime, slaked lime or red lime paste: add 1 teaspoon of lime to 1 gallon of water. Turmeric and lime ขมิ้นกับปูน is a Thai saying comparing 2 people who hate each other like turmeric and lime. When they get together, they react strongly to each other turn everything red (red spells trouble). Limewater is used in Thai cooking to keep fruit used in long cooking like banana in syrup or breadfruit in syrup. The fruit is peeled and cut and let soak in the lime water. The limewater can also be used to make batter crispy when fried. My mother stores her red lime paste in a jar filled with water. The heavier lime sinks to the bottom while the clear limewater floats above. When she needs the limewater, it's ready. She would pour the clear pinkish water out from the jar. She replenishes the limewater by adding more water to the jar. No need to refrigerate limewater or lime paste. Where to find red lime paste/pickling lime/slaked lime? Red lime paste, pickling lime or slaked lime is available at most Hispanic markets (an ingredient in corn tortillas, ask for 'cal'), Indian markets(an ingredient in paan, ask for 'chuna') and other Asian markets. They may come as white powder or red paste. If you get pickling lime from hardware stores, which often have canning materials available, make sure you get the food grade quality. The lime building material may contain metal such as lead. Here is a really good article on pickling lime.